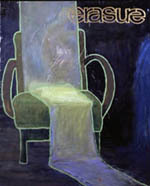 Lucy McKenzie is young Scottish artist with a growing international following. Developing her own lexicon of passé utopias, McKenzie draws relations between the most unlikely sources: East European propaganda murals, German abstract painting, Cold War iconography, industrialist typeface and 1980’s pop music. From money, pop stars, to Olympians, McKenzie paints fleeting moments of idealism: symbols of transient seduction and power. 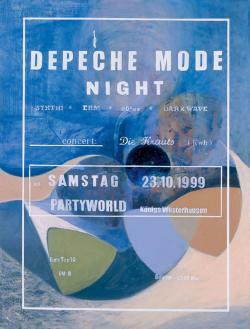 In Depeche Mode Night, she paints a concert poster over an ’anonymous’ abstract painting. It’s a haunting reflection of glory days, when culture was a political tool: when painting was Marxist dogma, and songs by a synth-pop band became the anthems for an entire generation caught between anarchy and Thatcherism. Painted in the washed out colours of memory The Danger In Jazz initially seems as threatening as a 1950s musical backdrop. But this is no Fred Astaire gig. Rather it’s taken from a video still of Lionel Ritchie’s performance at the 1984 Olympic Games. 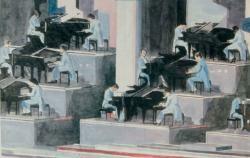 The Danger in Jazz is one of a series of paintings depicting the ceremonies of the 1980 Moscow Olympics (boycotted by the Americans), and the 1984 LA Olympics (boycotted by the Eastern Block). Beneath the pop-gloss nostalgia for the 1980’s lays a subterfuge often omitted: a Cold War battle for ideological supremacy, where pop music and sporting events were staged propaganda. In her portrait of Olga Korbut, McKenzie captures not the gymnast’s moment of crowning glory (winning three gold medals at the ’72 Olympics) – but rather her crushing parallel bars defeat which won her the hearts of millions. Fragmenting the image to a ’photo-finish’, McKenzie conveys a split second of historical immortalization in a freeze frame as imprecise and intangible as the real memory. Lucy McKenzie’s paintings explore the power of visual language. Drawing influence from Eastern European murals, graphic design logos, architectural motifs and avant-garde painting, her work mirrors these styles as hollow epitaphs of social and political ideology. In Festival, McKenzie’s tiny canvas flourishes with a detached iciness, its once resonant message buried within a richness of painterly application. McKenzie’s precious tones and fussy brushwork appropriates the form of classic design and infuses it with intimate sentiment. 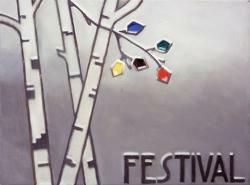 Festival feigns a spiritual luminosity of stained glass. In Stadium Towers, Lucy McKenzie appropriates a poster design for the 1980 Moscow Olympic Games (an apex of Cold War tension). Painted in worn-out tones, McKenzie alludes to a forgotten political history, as well as the failure of 20th century ideological art. Superimposed over the festive logo, McKenzie includes two militaristic towers, threatening violence and oppression. McKenzie often works from politically charged subject matter; through personal negotiation of propaganda and media material she reconstitutes the power of images, converting "once real" fear into the sublime resonance of aesthetics. 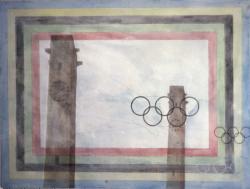 Lucy McKenzie’s Untitled reduces the 1980 Moscow Olympic poster design to an abstract motif, a requiem to the power of painting. 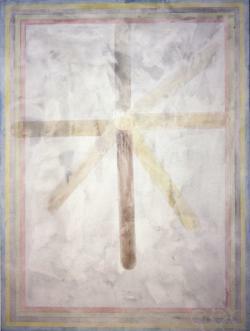 Bright bands of colour frame a central form of a broken octagram: a damaged symbol of completeness and regeneration. Reminiscent of supremacist painting, Untitled sentimentalises a failed Utopian vision. Whitewashing over her canvas, McKenzie sanitises an awkward history, and references the paintings of Kasimir Malevich, an art at odds with Stalinist policy.